2. 왜 내 전화 안 받아? 4. 그 사람 때문에 미치겠어요. 5. 그 사람이 한 말에 상처 받았어. 6. 그 사람이 한 말에 100프로 동의합니다. 7. 이 숙제 내일까지 내야 해. 8. 이번 주말에 뭐 할지 아직 결정 못 했다. 9. 그 친구 되게 오랜만에 봤다. 10. 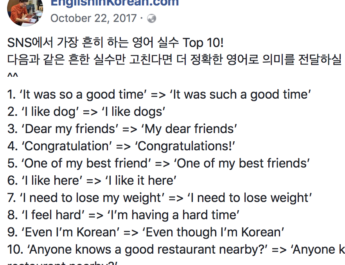 애인하고 싸웠는데 어제 화해했어. 1. I don’t think that will work out. 2. Why aren’t you taking my calls? 오답: Why don’t you answer my phone? / Why aren’t you answering my phone. 3. I’m starving to death. 4. He’s driving me crazy. 5. I was hurt by what he said. 6. I agree 100 percent with what he said. 오답: I agree with his saying. 7. I have to hand in this homework/assignment by tomorrow. 오답: I have to hand this homework in until tomorrow. 8. I still haven’t decided what to do this weekend. 9. It had been a long time since I had seen him. 오답: It had been a long time for me to see him. 10. I got in a fight with my girlfriend/boyfriend, but we made up yesterday. 안녕하세요. 2번 오답이 왜 오답인지 궁금해요. my phone이 내가 거는 전화가 아닌, “내 전화기”를 의미한다고 하시더라고요. 그러니까 내 전화기에 전화가 오고 있는데 왜 나 대신 받아주지 않았냐? 라는 뜻이 된대요. I want to get email for study english every day.